Aloha from Hawaii! Fike Farms of Hawaii, and our brand new label Kona Amor, same great coffee from a much improved farm, only produces 100% Estate Grown Kona Coffee. Published for years as the Best Kona Coffee in guidebook, Hawaii - The Big Island Revealed. Sir James Mackintosh said, "The power of the mind is directly proportional to the quality of the coffee." So what are you waiting for? Fike Farms of Hawaii placed in the Top Five of the 2014 Kona Coffee Festival Classic Cupping Competition. We are very proud of this accomplishment and wish to thank all of our customers, and hard workers, who made this possible! Fike Farms is a 19.5-acre coffee farm located in Keauhou-Mauka, a prime area for growing gourmet Kona coffee. The farm elevation begins at sixteen hundred feet and gently slopes up to two thousand feet above sea level. 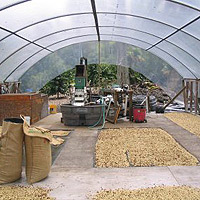 Our coffee is available in three grades: Extra Fancy, Peaberry, (when it is available) and Estate Grade. Our Extra Fancy is the very best of Kona coffee! Extra Fancy beans are the largest and most flavorful beans, and give a beautifully uniform roast with all the beans being the same size. Peaberry beans are unique in that they are small, round beans (unlike the two halves of other coffee beans) and have a more fruity flavor. The Estate Grade is a mix of #1 grade and Fancy grade beans. The Estate Grade mixture of different sized beans gives a unique, and varied roast due to the different sized beans. Visit our Coffee Shop and place an order for the most delicious and smooth Kona coffee available! All prices include free shipping by USPS Priority Mail within the United States. Please be advised, USPS Priority Mail from Hawaii takes between 3-5 days (3 days to West Coast, and 5 days to East Coast, not counting Sunday). We also ship worldwide. Please e-mail us if you require international shipping information as prices vary. Fike Farms of Hawaii accepts credit cards including Visa, MasterCard and Discover. We also accept PayPal, or money orders. We apologize that even though the menu option shows American Express, our website will not process payment with an American Express card. Fike Farms of Hawaii sells only 100% Kona coffee and is a supporter of the Kona Coffee Trademark program through the Kona Coffee Farmers Association. Fike Farms of Hawaii will no longer be able to offer farm tours due to our small operation. If you would like to purchase coffee at the farm please call ahead at 808-322-8100 so that we may make arrangements to accommodate you. If you aren't able to make it to the farm, our coffee is being sold at the KTA Superstore in the Keauhou Shopping Center, 8 oz. bags only, or on the Internet at www.fikefarms.com. Thank you so much for your interest in our coffee!